Constitution And By-Laws Of the Housatonic Fly Fishermen’s Association Inc. These By-Laws provide the basic structure for the operation of the HFFA. They are designed to enable the HFFA to conduct its business in the most expeditious and just manner and, accordingly, must be changed as necessary to reflect activities, objectives and structure. As a member of the HFFA you have a responsibility to be familiar with the By-Laws and to be certain that all club business is conducted in accordance with these By-Laws. Of the Housatonic Fly Fisherman’s Association Inc. Section 1. 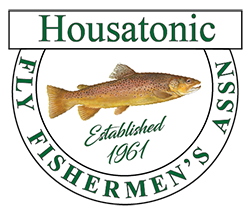 This Association shall be called the HOUSATONIC FLY FISHERMEN’S ASSOCIATION INC., also known as the H.F.F.A. Section 1. Having a strong and abiding interest in the Housatonic River and its continued existence as a famous trout stream, we are united to preserve and protect that fishery. We unite to promote good fellowship, to further the art and skills of fly fishing, and to aid in the formulation and establishment of sound policies to conserve, restore and protect the Housatonic River for this and future generations. Furthermore, the H.F.F.A. supports and seeks to enhance those local, state, and federal laws, policies and regulations, which protect the river; inhibit and deter flooding; deter river disturbance and pollution; prevent damage from erosion, turbidity, and/or siltation; prevent the loss of natural habitats, wildlife, and vegetation; and that encourage Public Access along the river. Treasurer, and Second Treasurer. Officers shall be elected by members of the Association at the annual meeting. Only those members, in good standing, attending the annual meeting, can cast a vote. Officers will hold the elected office for one year or until successors are elected. Section 2. Procedures for the election of officers and directors. Nominating Committee. If other nominations are received, then each contested office shall be voted upon separately from the rest of the slate. If there are any other nominations for Membership Representatives to the Board of Directors, then all the names which have been placed in nomination by the Nominating Committee, and from the floor, shall be announced and voted upon separately from the rest of the slate as follows: Each voting member is entitled to vote for only three of said nominees by placing the three names of his choice on his ballot, and the three nominees receiving the highest number of votes shall be the elected members of the Board of Directors as stated in Article VIII, Section 1. Section 3. All Officers and members of the Board of Directors shall be active members, in good standing. scheduled Association meeting. The election shall be held during the second meeting following the publication of the Nominating Committee candidates. The election process shall be conducted as outlined in Article III Section 2. If there are no qualified petition candidates, the vacancies may be filled during the second meeting following the report of the slate by the nominating committee, by a motion duly made, authorizing the Secretary to cast one ballot for the slate as presented. Section 1. The President shall preside at all meetings of the Board of Directors. He is to perform such other duties as usually pertain to the office of President, as well as those delegated to him by the Board of Directors. Section 2. The President with the consent of the Board of Directors, shall appoint all necessary committees and their chairman to carry on the work of the Association. The President shall be a member ex-officio of all committees, except that he shall not vote as a member of such committee except in case of a deadlock. President, the Vice Presidents, in order of priority, shall perform the duties of the President. Section 1. The First and/or Second Secretary shall attend all meetings of the Association and of the Board of Directors and shall keep a true record of the proceedings at such meetings. They shall have custody of all records, contracts, documents, books papers and correspondence of the Association. Association of every meeting of the Association and each member of the Board of Directors of every meeting of the Board. They shall perform such duties as usually pertain to the office of Secretary and such others as may be assigned to them by the Board of Directors. Section 2. To remind the Board of Directors to file a Biennial Report to the Secretary of State. Also remind the President to appoint three club members in good standing to audit the books and report at the annual meeting. Section 1. The Treasurer shall have charge of all funds and securities of the Association. He shall keep and account of all receipts and disbursements. He shall be empowered to establish and maintain a petty cash account not exceeding $150.00, upon which he may draw with the approval of the President, in order to facilitate the payment of necessary current expenses. He shall report in detail the financial condition of the Association at each regular and Annual Meetings of the Association. He shall perform such other duties as usually pertain to the office of Treasurer, as well as those that may be assigned to him by the Board of Directors. perform such duties as may be directed to him by the Board of Directors. Section 1. The Board of Directors shall (a) have charge of the affairs of the Association; (b) take cognizance of all infractions of the constitution and by-laws. of Directors, shall each be entitled to one vote at all meetings of said Board. Section 4. From time to time the Board of Directors shall recommend the amount of dues, initiation fee and other assessments from the members. Section 5. It shall be the duty of the Board of Directors to transact the business of the Association between regular meetings. Section 6. It shall be the duty of the Board of Directors to approve work plans and expenditures of the Special Committees and be responsible for the same. Section 1. The President with the advice of the Board of Directors shall appoint a chairman for the following standing Committees. Section 1. To become a member, an applicant must agree to support the objectives of the Association as given Article II of these by-laws. vote at a regular meeting. No one may continue in membership or vote whose dues or assessments are more than two months in arrears. appear before the Board of Directors, and show cause why he should not be so suspended or expelled. If notification is ignored he shall be expelled. Board by vote of a majority of the Board of Directors. Section 5. Each member in good standing will be entitled to one copy of the By-laws and amendment sheet upon request. position or Committee by a majority vote of the Board of Directors. Procedures established in Article X Section 3 shall be followed. three members of the Board of Directors. of Directors shall be called by the President. Section 5. Fifteen (15) members shall constitute a quorum at any Annual, Regular or Special Meeting of the Association. Section 6. The regular meetings of the Board of Directors shall be held on the 3rd Thursday of the month from September through June. Directors could meet monthly from September through June, but not less than five (5) times through the club year to conduct the business of the club. Section 8. The President shall appoint three (3) members to audit the books before the Annual Meeting. notice of the intended action. Section 4. All bills must be submitted on the appropriate form and must have the approval of the majority at a regular or special meeting of the Association. any indebtedness of $400 or over shall require approval of the Board of Directors also. what purposes, projects, and activities will require the expenditure of funds and shall recommend an amount to be allotted to each such purpose, etc. This budget may be changed at any time during the year by proper motion and vote. be mailed to each member of the Association. The notice must also include the member(s) proposing said revision(s). Section 1. All meetings shall be governed under Roberts Rules of Order. 1. Bylaws and Constitution re-adopted at a meeting held 11/1/05.